We will have the TeachLivE newsletter back on distribution this month in time for the holidays! Looking forward to reconnecting with our friends. TeachLive Co-Teacher Scenario A Success! Our fabulous partners at CSUN put together a fantastic new application of our adult avatar, Stacey Adkins. Stacey portrayed a SPED teacher who was disgruntled with her current co-teaching situation. Student participants in the role of the co-teacher had to understand Stacey's position and then work to create common goals to ensure the success of the students. A fantastic learning opportunity! Earn a Micro-credential in TeachLivE! We have a couple of new ones in the works, so check back to see what's new! Great post from teachers' perspective about TeachLivE. Cool to see our folks at William and Mary playing in the TeachLivE lab. TeachLivE Partners - You are on the Map! Find out who has TeachLivE in your area using our interactive map created by Kelly, our awesome web designer. Thanks, Kelly - now we know where to find our friends! 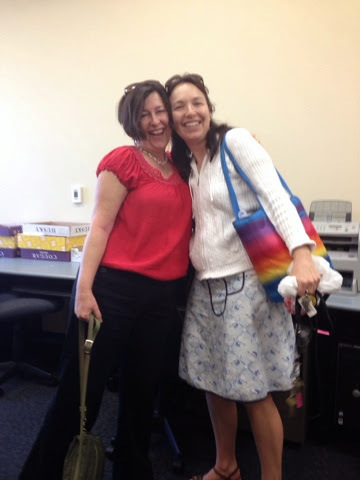 We miss Lisa Dieker, our fearless leader, who is currently visiting China with our TeachLivE avatars. Lisa, we hope to have you and the kids back home soon! Sean and the gang had an exciting experience this last week visiting the University of Macau in China. Our student avatars had a chance to learn some Chinese from area professors and meet visiting faculty from around the world. These avatars are becoming real globe trotters! Pilots Use Simulation as a "Mental Gymnasium"
Orlando is a hotspot for simulation - not just for TeachLivE for teachers - but pilots use it to brush up their skills too. They call it "mental gymnasium for pilots". Check out this article in the Orlando Sentinel. The entire technical report of research findings for the TeachLivE National Research Study is available at http://teachlive.org/publications/. A quasi-experimental, pre-post group design was used to examine the effects of repeated virtual rehearsal sessions in a mixed-reality computer simulated environment, the TLE TeachLivE™ classroom simulator. At 10 sites across the nation, 157 middle school mathematics teachers received four levels of innovative professional development, including computer simulation, synchronous online instruction, and lesson resources based on the Common Core State Standards (CCSS). Teachers were observed in the TLE TeachLivE™ (TeachLivE) classroom simulator and in their regular classrooms to determine the effects of treatment. Trained observers (a) collected pre-post frequency counts of teacher behavior on questioning, wait time, and feedback; (b) scored teacher classroom practice on modified sub- constructs of the Danielson Framework for Teaching; and (c) took qualitative field notes. Teachers responded to questionnaires covering demographic information and experiences in the classroom simulator. Student level data were collected pre-post on a 10-item academic assessment using items from the eighth grade 2011 National Assessment of Educational Progress. From an analysis of the data, the researchers found that four 10-minute professional learning sessions in the TeachLivE classroom simulator improved targeted teaching behaviors in the simulator scenarios, and those improvements transferred into the teachers’ original classroom settings. Results from this study validate emerging research in the field of teacher education and simulation that suggests that professional learning in mixed-reality simulated classrooms can be effective in impacting teacher practice. This research project was supported by funding from the Bill & Melinda Gates Foundation. Great to be mentioned on the Institute of Play site. Nice video of our work. The TeachLivE middle school students met many interesting University architects and civil engineers here at UCF for SCUP conference. One "substitute teacher" had a mock election for class president and Ed won. Although Sean was disappointed, he will be a faithful secretary of state. Matt wins the social media contest! Congrats, Matt! You are the social media master and winner of the TeachLivE social media contest. Check out our very first micro-credential on Eliciting Thinking with Open-ended Questions, created in partnership with Digital Promise! UCF TeachLivE's Sean and musician, Bosho make plans to go on Shark Tank! At the Denver Share Fair, the TeachLivE Middle School and High School kids got to interact with many interesting people and meet lots of new teachers. They also met Bosho, the musician from Bosho and Friends who has a wonderful program of songs to promote language learning. Sean suggested that he go on the TV show, Shark Tank and they are hoping they will both be guests on the same episode. Tres Bien!!! Always good to make new friends!! Carl Watson, PD Resource Specialist for Osceola Public Schools, Cherie Behrens of University of Central Florida, and Janice Franceschi, Director for Professional Development for Osceola Public Schools accept an award from the Florida Association for Staff Development for their innovative work with instructional coaching using TeachLivE. UCF has a TeachLivE open lab this Friday 9/26 from 1-5. Students can sign up and practice higher order questioning with the avatars with feedback from a coach. Contact TeachLivE to find out how to sign up. Celebrating Dean Jarley's win from the College of Business at the Teacher Palooza on Saturday. Great blog about his success! Always great to have kids visiting the lab. Great time at the Teacher Palooza watching 5 Deans try to convince our middle school avatars to attend their alma mater. We also had a visit from some furry friends. Save the date for our third annual TeachLivE conference! It's a fly-in/fly-out conference with one overnight, so you can fit it in your busy schedule. Dr. Katie Ingraham learns from partners about innovative work being done with TeachLivE. Teachlive Kids visit Black Spectrum Theatre Company in Queens! Jermain Smith, director of technology at Pace University, did a wonderful job of facilitating a session using TeachLivE for the marvelous teachung arts twists, site coordinators and staff of the Black Spectrum Theatre's after school programs. Thanks Jermain!! Teacher candidates come to our TeachLivE classroom with questions at each English proficiency level. They ask the EL avatars their leveled questions and soon learn a few things. EL students need simple questions . They need slower pacing of words in questions and they need visuals to help understanding. These beginning teacher candidates learned valuable lessons for their own classrooms. Come say hi to the TeachLivE class! TeachLivE Conference 2015 - Save the Date! Lisa Dieker has a laugh while Charlie Hughes and Cheryl Hines share a moment. 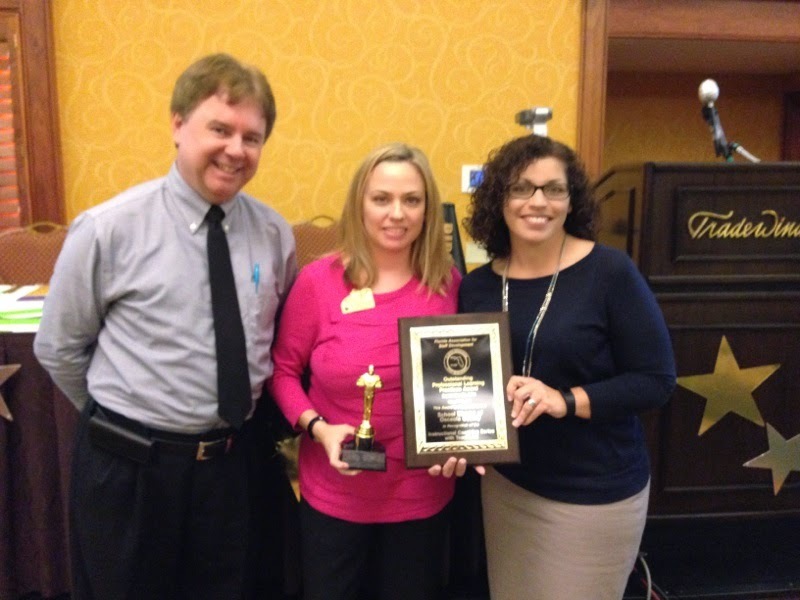 The Osceola School District has been selected as the recipient of the 2014 Outstanding Professional Learning Practices Award given by the Florida Association for Staff Development (FASD). The selection committee was very impressed with the district's Instructional Coaching Series with TeachLivE, and commended the Osceola School District's Professional Development Department for its diligent work in providing exemplary professional development to teachers and staff. The Osceola School District will be recognized at the 2014 FASD Fall Leadership Conference Awards Luncheon on Tuesday, September 23, in St. Petersburg. During the luncheon, a FASD award plaque will be presented to the district by the FASD Awards Committee. The Instructional Coaching Series is a professional development experience provided in the Spring of 2014 to instructional coaches in the Osceola School District. This unique learning opportunity focused on the four instructional coaching tenets developed by Dr. Cherie Behrens, University of Central Florida Visiting Lecturer and Consultant. The four tenets are: Operating as a Coach; Facilitating a Culture of Learners; Supporting a Data Focus; and Promoting Student Success. In this three-day series presented by Dr. Behrens, instructional coaches learned how to use coaching language with teachers, build relationships with teachers, create peer coaching cadres, and utilize data to problem solve in professional learning communities (PLCs). The instructional coaches were guided through a series of centers designed to ignite and build background knowledge and provide opportunities to practice. The most impactful technology utilized during the sessions was called TLE TeachLivE™, funded by the Bill & Melinda Gates Foundation. TeachLivE is a classroom simulator populated with specifically-designed avatars that interact with educators. TeachLivE uses differentiated learning techniques and a formative assessment feedback model to provide each user or user groups with a different experience that changes based on the actions of the educator(s) in the simulation. During each session, TeachLivE was a center on its own where coaches could further hone their abilities coaching teachers, practicing what was learned in the sessions, utilizing "look for" documents for further coaching conversations, and more. This was done in an unpredictable but realistic way using a mixed-reality environment. Emerging research suggest that teachers receiving professional development that utilizes TeachLivE increased in targeted teaching skills as compared to teachers who do not receive TeachLivE (Dr. Carrie Straub, 2014). The Instructional Coaching Series will be continued during the Fall 2014 for a new cohort of instructional coaches. The series will be provided as a train-the-trainer model where district coaches will be able to provide the training to school-level coaches. Look for an email from UCF College of Education with more information to come! Check out our quick pic of Lisa talking about avatar misconceptions and using avatars to teach challenging STEM subjects. Faculty from CSU Channel Islands talk to Sean about his science activity - a canoe trip to Wekiva! Higher order thinking questions, wait time, affirmations. These are all possible microcredential topics being explored at TeachLivE at UCF. Give us four 3 minute time segments and we can improve an educator's skill. 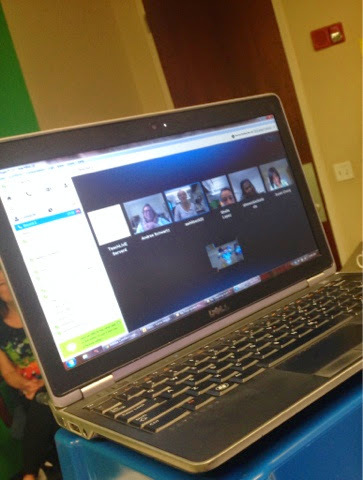 We are having our first team meeting with the new doctoral candidates who will be working with us in TeachLivE at UCF. Welcome to this dynamic crew! We look forward to a great year with them. Today is the first day to kick off the Fall semester and what better way to begin with installation and tech checks of our new version of Teachlive. Our partners are already impressed with the quick download (one download took 5 minutes) and how user friendly it is. We are so excited for the new semester and please make sure you sign up for your version installation and tech check before your scheduled sessions. We only have a few more spots open up for our tech checks.Please schedule at Teachlive@ucf.edu. TeachLive students are thrilled to meet PBS celebrity Miss Rosa! Sean jumped to his feet in excitement when he discovered the guest in the classroom was Miss Rosa from the popular PBS series. Ed quietly asked for an autograph he could take home to his little sister Lily, a fan of the show. 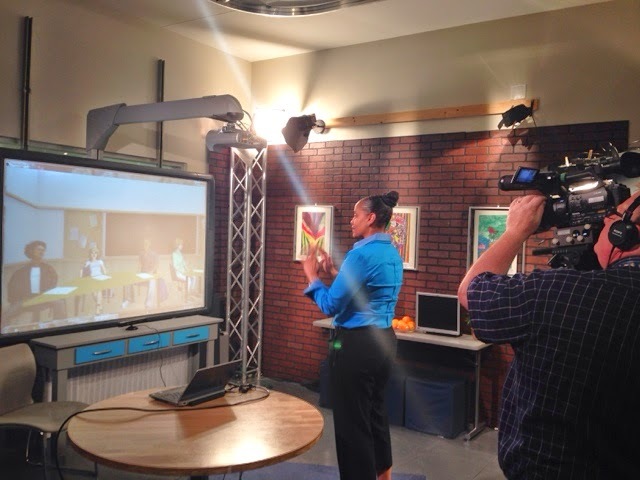 Miss Rosa chatted with the TeachLive avatar students and shared her experience. Thank you, Miss Rosa for the thrill of an avatar lifetime! The UCF Foundation is using simulation to help their team refine their communication skills and strategies to raise funds for the University. With expert coaching, they have the opportunity to repeat visits or repeat a moment with empowered or refocused language, or body language! They are developing a terrific application that will help potential philanthropists find their dream gift match. TeachLive middle school students had an opportunity to question visiting high school students at WMU about their experience in high school. The high school students jumped at the chance to get to know Sean, CJ, Kevin, Ed and Maria and quell their fears about moving on to high school. Maria was thrilled to find a kindred spirit amongst the participants speaking at length about shared interests and authors. 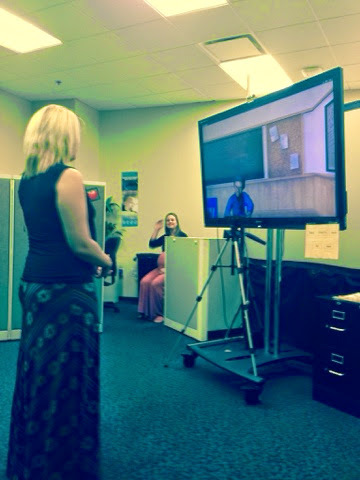 WMU helped the participants appreciate the application of TeachLive in the college classroom. TeachLivE has a busy schedule already for demos this fall. We are excited to be working with our partner sites and showing off to new possible partners. For the past few months we have been developing our avatar with autism, Austin. All summer we have been working with Buffalo State, Kennedy Kreiger and tomorrow we have a fantastic session with USU tomorrow with Austin! TeachLivE at UCF team is excited to consider about how we might use the micro-credentialing process. We're so excited about all the demos scheduled this coming Fall 2014 semester! Our avatars really appreciate the opportunity to share their stories and meet new friends from all over the country, and the world! Thanks for visiting us from Daytona State College! Our kids loved talking to you about their super-top-secret science projects - just remember to not tell anyone their plans! nce we got the avatars settled down for class!!!! There are currently 42 campuses across the country using TeachLivE. We are excited to see our simulator pick up steam as it's also used in numerous school districts and other government agencies in fields such as medicine and military. Welcome TeachLivE Interns from RTP3 Program at UCF! This week, TeachLivE welcomes four interns from the UCF Resident Teacher Professional Preparation Program (RTP3) program. During their week-long internship our interns are getting experience with research on multiple levels. Overall, they are learning about group design methods for research. They are learning how to conduct classroom observations using the Teacher Practice Observation Tool as well as score student concept maps using the Student Idea-Generation Evaluation method. Some interns are participating in a single-case research project with the purpose of using a simulated setting to learn how to conduct a functional behavior analysis. At the end of the week all of our interns will be able to say that they have experience working on a large scale research project. We are so glad to have them on board! Please check out some of our amazing photos from our 2nd Annual TeachLivE conference! We can't wait until next year. Have you seen all that TeachLive has to offer? You can follow us on Twitter and Google+ and our website and this blog! Stay current with your avatar friends and join us in the conversation today. Our friend and local colleague Hank Okraski has published "Developing the Future Modeling and Simulation Workforce with the Skill Sets to be Competitive in a Global Environment" in the International Test and Evaluation Association June 2014 journal. Mr. Okraski is a renowned consultant in the simulation industry and gives a shout-out to TeachLivE. Our TeachLivE avatars meet new friends at Woodrow Wilson National Fellowship Foundation! Have you twittered your latest TeachLivE activities or checked out our website lately? 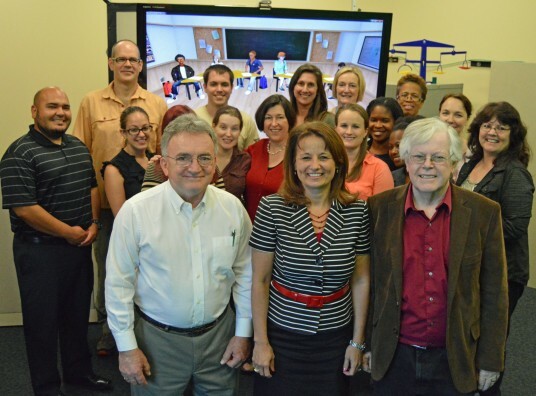 TeachLivE at UCF was included in the INNOVATIONS INVENTORY by AACTE as an innovative practice. The Innovations Inventory is an online database highlighting members’ innovative practices that provide educator candidates a competitive edge in the field. Members are invited to submit examples of unique or new approaches to educator preparation that address issues of student learning, preparation program advancement, or educator workforce needs and that show evidence of positive impact on those areas. Reviewed submissions are included in a directory, and exemplary programs are highlighted periodically on the web page, in publications, and through several other outlets. Cheryl Hines with the UCF TeachLivE Avatars - No wonder Sean is smiling:). Thank you to everyone who attended the 2nd TLE TeachLivE Conference at UCF in Orlando. A big thank you to our PIs Drs. Dieker, Hughes, and Hynes for hosting this event. And congratulations to Ben and Taylor for a job well done in planning and executing such a successful conference. If you missed the conference please feel free to review our twitter feed @TeachLivE. The conference has been a smashing success thus far. We've been spoiled with celebrity Cheryl Hines' entertaining keynote, Gates Foundation's Scott Benson's informative keynote, and now concurrent sessions on just about every collaborative TLE research partnership at the conference. Keep informed and see pix with our Twitter feed @TeachLivE. If you're savvy enough to be attending the TeachLivE conference this year, you're going to be amazed at the array of innovative technologies our friends at the Institute for Simulation & Training (IST) have in store for you. On Friday, May 23rd we'll be heading to IST, a short drive from campus. Headed to dinner? All dinners are Thursday, May 22nd at 6:30 p.m. Sign up here. This playlist features exemplary TeachLive classroom simulation in action. 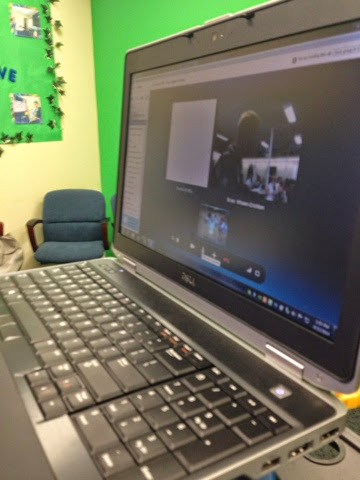 TeachLive in HISD from Houston ISD on Vimeo. We're all gearing up for the 2nd annual TeachLivE Conference at UCF this week. 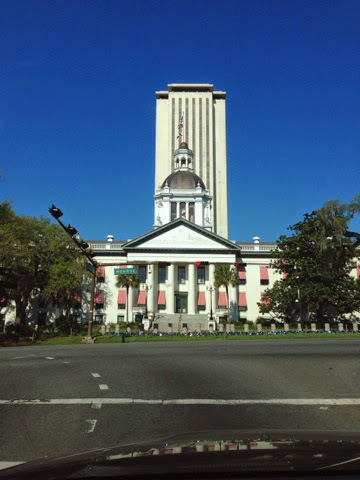 Whether you're in Orlando or not, you can follow us on Twitter @teachlive and Facebook https://m.facebook.com/TeachLivE. 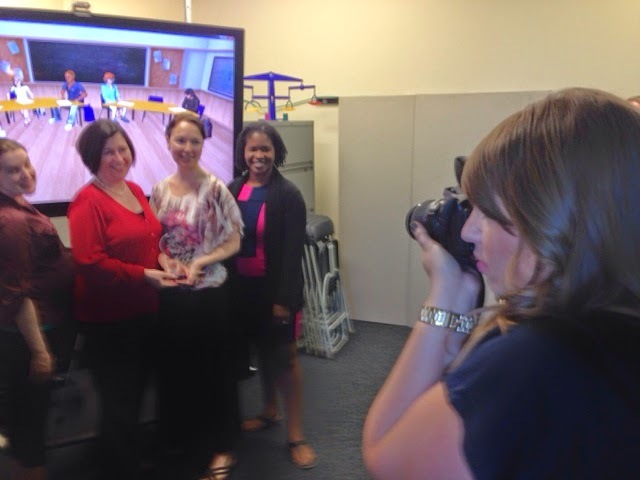 Check out the latest news from UCF today about TeachLivE at UCF classroom simulator. Acclaimed artists pose for a photo shoot. Pictured from left to right: Katie, Morgan, Felicia, and Michelle and UCF photographer Courtney Gilmartin. Great to be a part of such a prestigious group of folks to receive awards at New Schools Venture Fund Award Banquet. Congrats to the UCF team and to the Avatars - Sean, CJ, Maria, Kevin and Ed. 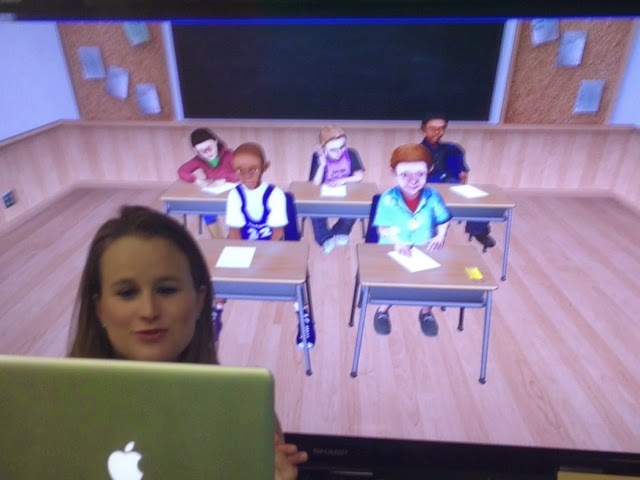 Teachers at Winter Park High School in Winter Park, Florida are learning from avatars! Yesterday marked the first day that TeachLivE at UCF partnered directly with a school to provide professional learning to teachers. The results were amazing - after only one 10 minute session, teachers doubled their student talk time and higher order questions. Great work being done by passionate teachers at Winter Park High School, thanks to Principal Tim Smith and Literacy/Instructional Coach Elizabeth McClure! Great article today about the future of technology in Education Week Blog. Excited to see a shout out for TeachLivE as part of the blog. As a new member of the TeachLivE team, I am looking forward to attending my first TeachLivE National Conference on May 22 and 23 at UCF. Please join me and learn more about TeachLivE! 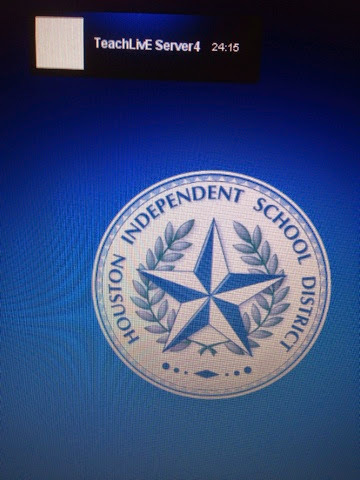 Houston Independent School District is thinking differently how about how to work with teachers. They are partnering with the University of Central Florida's TeachLivE project and here they shoot a video letting educational stakeholders know about their work. See Karla Auzenne as she interacts with the avatars! TeachLivE UCF at Houston Independent Schools! Our TeachLivE avatars are having fun in Houston! 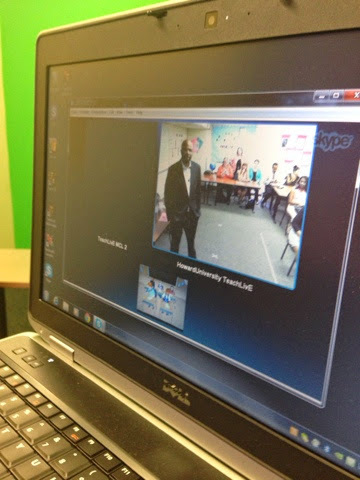 Having so much fun with our friends from BeyondZ during a Skype demo with the UCF TeachLivE avatars. The TeachLivE avatars had a great time visiting the Florida Department of Education State Board Workshop last week! Here are some of our favorite celebrities: Morgan Russell and Felicia Graybeal. Lots of interest at the Council for Exceptional Children in Philadelphia for new partners with our Avatars. We look forward to having more great colleagues collaborating with us in our work in using the avatars to support teachers. What does the class want to be when they grow up? Kevin: He can't decide between being a Music Producer or Director. He found out today that maybe he can do both! CJ: Wants to be a celebrity, but someone gave her a great idea about doing her own clothing line! Maria: An Engineer, maybe Mechanical or Chemical. The class wants to thank all the people today that helped with making their career decisions today. We are hoping to get some of our Canadian Colleagues to start using our Avatars. I wonder how Sean and CJ would like to be Canadian? Simulation Conference: UCF Second Annual TeachLivE Conference. Come see how we use simulation for teacher preparation. On our way to share the good news about TLE TeachLivE in Philly at CEC! This is a great article from last summer and it shows how amazing the TeachLivE program is! Please see the link below. 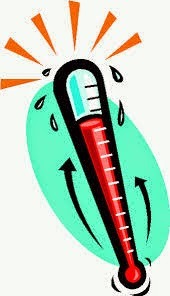 The weather is getting warmer and things are heating up at TeachLivE too. We just hit 45 client partners, and more are signing on. We hope to have 50 clients signed on before our conference May 22-23. Sign up for the second annual TeachLivE conference to join us in the warm weather in May. 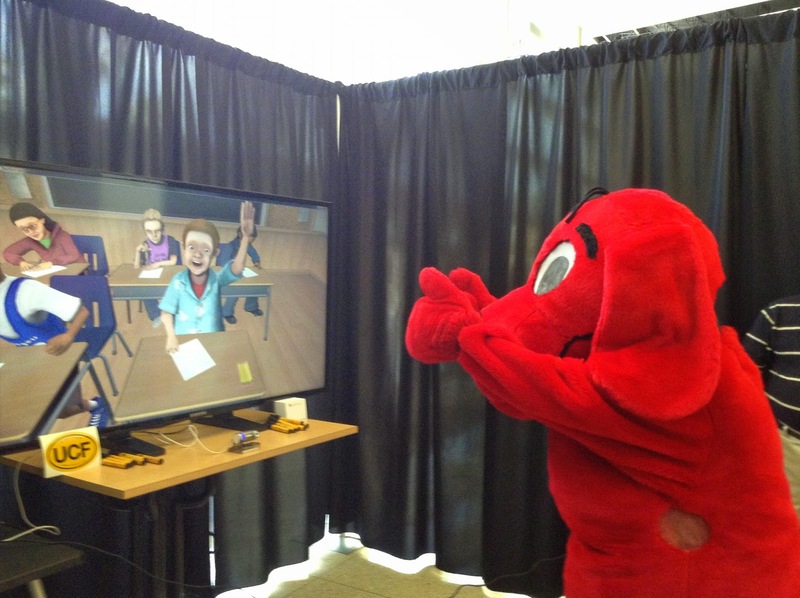 Checkout the great picture of Clifford talking with our avatars at the UCF Book Fair. Congrats to our friend Dr. Susanne James at SIUE who just received IRB approval for her work on our National TeachLivE Research Project with TeachLivE UCF. She already has tons of experience working with avatars in teacher education, but this will be her first time partnering with TeachLivE UCF in the national research study. Looking forward to working with you, Susanne! Even Physics students at UCF practice their instructional practices. In the TeachLive simulator undergrad pre-service Physics students took turns teaching a high school Physics lesson. They then reflected on their delivery, received feedback from their professor, and TRIED IT AGAIN...only better! All of this was done without hurting student learning and only helping teachers get better. Just wanted to send a quick reminder to sign up for the TeachLivE conference. Space is limited! Nazan Bautista, Miami University associate professor of teacher education, has received the 2014 National Technology Leadership Initiative (NTLI) Fellowship award for the study she presented at the Association for Science Teacher Education (ASTE) conference held January in San Antonio, Texas. Bautista’s study investigated the impact of a mixed-reality teaching environment (TeachLivE Lab) on preservice early childhood teachers’ understanding of inquiry-based science and self-efficacy beliefs. 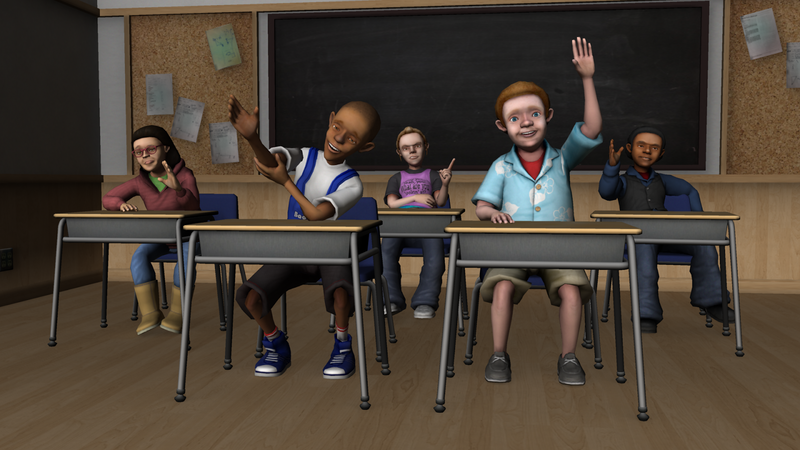 The TLE TeachLivE ™ simulated teaching environment uses computer-generated avatars to be as similar to real students as possible. The NTLI Fellowship award has been given since 2000 and is sponsored by the Society for Information Technology and Teacher Education (SITE). The award is given to researchers for their exemplary use of technology in teacher preparation with the purpose of furthering dialogue within professional associations regarding appropriate technology use in teacher education. Bautista will receive a plaque and $1,000 from Vernier Software & Technology. She will present her work at the 25th annual SITE conference on March 19 in Jacksonville, Florida. 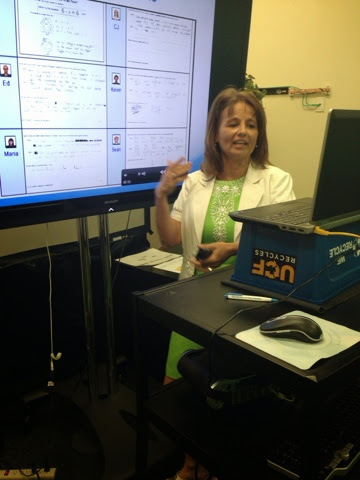 At UCF, students can even use the TeachLivE lab to work on their individual teaching skills. If you are interested in becoming an even more skilled teacher, ask you professor to sign you up. If time is available, you can practice in the lab for an hour with the lab coach, Pam Jones. This is just one of the many perks of going to school at UCF. Please bookmark this blog to find out the latest news from TeachLivE!